Sell My Car With A Blown Engine: If your car’s engine is blown, your engine repair costs may be out of control. Because of this, selling your car may be the better option. Complete online quote form or call us on 0800224000 & get an offer now. Guaranteed Offer for Your Blown Engine Vehicle Today! The Engine is Blown or Seized, Now What? Engine seizure is like a heart attack in the automotive. And, if you rely on your car like most of us do, an engine crash can make you feel like you’re going to have a heart attack. Don’t worry. You have options. Engine repairs tend to be very expensive and aren’t always the best option. Before you spend hard-earned money on fixing your old car, get the best no-obligation offer from us. We will Buy your Bad Engine Car! No Haggle. No FEES. FREE Nationwide Towing! Here at Cash for Car NZ, we specialize in buying cars in any condition, running or not. Based on your vehicle details and location we will give you the best, best no-obligation offer for your vehicle, no matter the condition. Don’t spend your money on engine repair costs. Sell it. Maximize your time and money by selling your car to us. We’ll give you the best offer for your car, FAST! Do you have a car with a seized motor? Cash for Car NZ buy your car fast & easy. You can get paid cash for your car. Save yourself the hassle of fixing your car. Get the money for a new car. We’ll pick up your seized or blown engine car from anywhere. What are my options? If Bad Engine Problem! Read on about blown engine issues & what to do in case you have one! How do you know your engine is failing? What are signs of a blown head gasket or blown engine? How do you know when your car’s engine is about to throw in the towel? What are the symptoms and signs of engine failure? After an engine failure, what do you do with your car? Worried about the repair cost of your car’s engine blowing your budget? There are ways to know if your car engine is blown. Check out this list of common signs of a seized engine. If your car is using a lot more oil than it has in the past, that’s not a good sign. Actually, it’s a double whammy. If your car doesn’t have enough oil, it has insufficient lubrication between the moving parts, which is a recipe for overheating, severe engine wear and major engine damage. And, the fact that the oil you put into your car is disappearing at an alarming rate is a sign of potential serious engine problems. Engine lubrication occurs within a closed system, but if you’re losing oil in your car, it has to be going somewhere. There are only really two options for where your oil is going. First, there could be cracks and gaps somewhere, like a bad head gasket, allowing engine oil to leak out. If you have a giant oil slick under your car, that would be a clue that you may have a leak that needs attending to. Your second option is that your car is actually burning oil. A sign for that would be the blackish-blue smoke and the smell of burning oil coming from under your hood resulting from bad valve guide seals, piston rings or any of a number of other bad things. Basically, if your car is going through engine oil at an accelerated rate, you should get it checked by a mechanic, ASAP. You need coolant to prevent your car from overheating. But, if you’re burning through coolant, you need to get your car to a mechanic quick. A small coolant leak and the resulting white, steamy smoke could be a sign of a much bigger problem like a blown head gasket, a damaged cylinder head or cracked engine block. Worse yet, if your coolant mixes with your car’s oil, not only will you have the coolant system problem to worry about, but your oil’s viscosity will get all mucked up, preventing proper lubrication, and leading to all sorts of other problems. Black smoke from your exhaust pipe means you’re burning too much fuel. This could be as straight-forward a problem as a bad fuel-air mixture or as troublesome as bad fuel injectors, cylinder issues or a clogged fuel return line. Blue smoke coming from your exhaust pipe means your car is burning oil. This is a bad thing. See symptom number 1. White, steamy smoke coming from your exhaust pipe equals burning coolant. Again, possibly a big problem. See symptom number 2, above. If your car’s gas mileage suddenly and drastically decreases, your engine may be driving head-first toward engine failure. Bad gas mileage may just be the result of a bad tank of gas. But, I wouldn’t take the risk. If your MPGs fall off, go get your car checked out, especially if it accompanies any of these other symptoms. An internal combustion engine works through a series of regulated explosions. And, sometimes those explosions get slightly unregulated. Knocking noises coming from your engine could mean your camshaft isn’t working in proper sequence with the pistons. If that’s the case, you may want to fill out the DamagedCars.com offer form now. But, it could also be small, unregulated detonations occurring in your cylinders resulting from too much heat and pressure in the combustion chamber. These small explosions can cause serious or unrepairable damage to your cylinders and pistons. If not caught early and repaired quickly, engine failure is a likely possibility. What does Cracked engine block repair cost? Whether your engine block is cracked or not doesn’t make the situation much worse. If your engine is seized it is pretty much useless. The cost of replacing the engine may run you upwards of $1000. That may be almost as much as your car is currently worth. 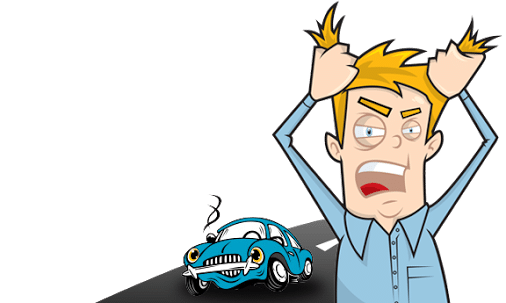 What do you do with your car after an engine breakdown? If you’re experiencing any of these signs and symptoms of a blown engine or engine failure, you should probably get your car to a mechanic ASAP. If it’s already too late and your mechanic started playing taps over your knocking, smoking, leaking car. Cash for Car NZ is here to help you out. Selling your car to Cash for Car NZ is the easiest way to get paid for your seized engine, junk or broken-down vehicle. We make the process fast, easy and convenient by picking up your car at no charge to you, nationwide. Cash for Car NZ has over ten years of buying wreck cars, old cars and even late-model Cars, Vans, SUVs, 4x4s and Trucks with mechanical problems like a blown engine. Remember, because repair isn’t always the best option, sell your car to Cash for Car NZ where we buy cars in any condition, nationwide. We pay top dollar for your car that has an engine problem.